Share "Crate Training your Dog"
There are typically three kinds of cages: metal wire, nylon crate and plastic pet carrier. Wire is the most popular because your dog can see his surroundings and they most likely aren’t going to escape from them. The soft-sided nylon crates are okay, but if your dog chews or scratches a lot, the crate can become easily damaged. Plastic pet carriers are used primarily for traveling. 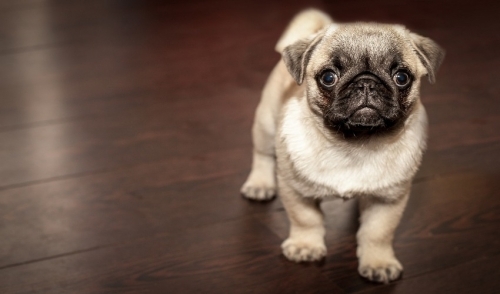 In addition, your dog may feel a bit confined because only one side is completely open. Pet carriers are also much harder to clean. In any case, size matters. 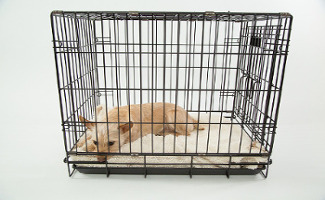 You will want a cage that is big enough for your dog to lie and turn around in, but not much more. If it is too large, they may choose to use the excess space they don’t lie in as their personal bathroom. At first, you will not want to throw your dog in the cage and expect him to know what’s going on. If anything, he will think he is getting punished and that is not what you want. At all stages of the process, keep it positive. Never put your dog in the cage to punish him or he will learn to fear it. To start off on a good foot, place something soft for him to lie on and some toys in the cage. Leave the door open and don’t force him to go in. When you see your dog wander in the crate on his own, praise him and give him a treat for doing it. Until he seems comfortable in there, don’t move on to the next stage. Once you feel like your dog is comfortable, close the door but stay in the room. After waiting a few minutes, if he isn’t whining or barking, open the door again and let him out. Keep doing this while extending the time that your dog stays confined. Once you get it up to an hour with your dog being comfortable, you should be all set. Just like you, your dogs have the need to go to the bathroom. They can hold it for 3-4 hours but you should not expect much more than that. Crates are good for when dogs can’t be supervised but they should not be used for an indiscriminant amount of time. Also, as briefly mentioned, never let out a dog that is barking or whining while in the cage. If you do, they will associate making noise with getting out of the crate. That is not a habit that you want them to have.